DE3 System Builder, a powerful tool comes with the DE3 board. This tool can help users to create the Quartus II project files for DE3 board basic on their custom design. 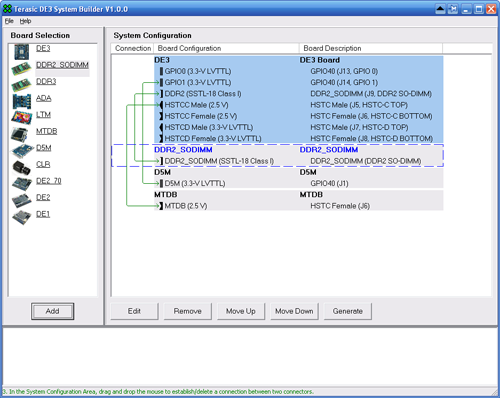 The top-level design file, pin assignment, and I/O standard setting for the DE3 board will be generated automatically by the DE3 System Builder. 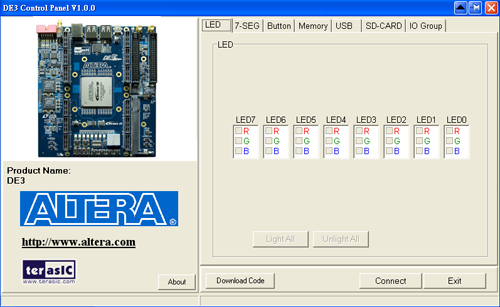 The DE3 board comes with a PC-based Control Panel that allows users to access various components on board. The host computer communicates with the board via USB port. The tool can be used to verify the functionality of components.